Sputtering is driven by momentum exchange between the ions and atoms in the materials, due to collisions. Sputtering from a linear collision cascade. The thick line illustrates the position of the surface, and the thinner lines the ballistic movement paths of the atoms from beginning until they stop in the material. The purple circle is the incoming ion. Red, blue, green and yellow circles illustrate primary, secondary, tertiary and quaternary recoils, respectively. 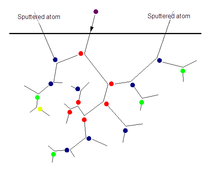 Two of the atoms happen to move out from the sample, i.e. be sputtered. The incident ions set off collision cascades in the target. When such cascades recoil and reach the target surface with an energy above the surface binding energy, an atom can be ejected. If the target is thin on an atomic scale the collision cascade can reach the back side of the target and atoms can escape the surface binding energy `in transmission’. The average number of atoms ejected from the target per incident ion is called the sputter yield and depends on the ion incident angle, the energy of the ion, the masses of the ion and target atoms, and the surface binding energy of atoms in the target. For a crystalline target the orientation of the crystal axes with respect to the target surface is relevant. SCT offers many coaters to address the needs of our customers. Albeit our standard coaters, replicated OEM systems of the past or custom engineered, we deliver coating systems with both price and performance as key.